Don't you just love easy no bake recipes? I know I do! 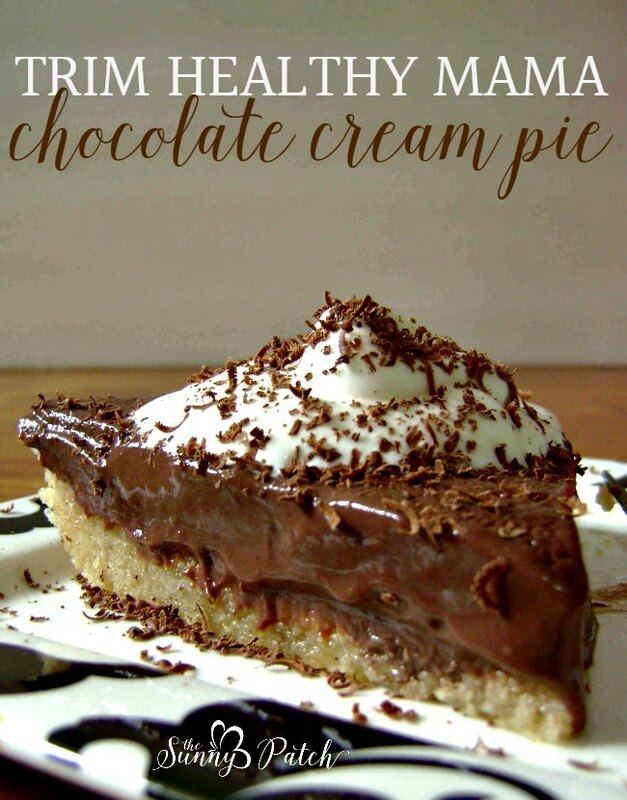 So I'm excited to share another easy recipe - Trim Healthy Mama No Bake Chocolate Cream Pie. Cream pie is an easy dessert recipe. It takes a bit of time to get the filling to thicken and set, but after that, the refrigerator does all of the work! This recipe uses two previous recipes - No Bake Pie Crust & No Bake Vanilla Cream Pie filling. This no bake chocolate cream pie recipe uses basic low-carb ingredients like almond milk and heavy cream. To thicken it, the combination of egg yolks and gelatin does the job nicely. It has all the comfort food taste of a cornstarch-thickened pie, without all the carbs. You will need a low-carbohydrate sweetener like xylitol (Truvia or other sweeteners would work well too). And, with a no bake pie crust, it's a perfect summertime treat - no oven needed! No oven needed, but you will want to be watching the filling for this no bake chocolate cream pie as it comes to a simmer. So it’s not completely without some work involved! First, you’ll want to get your pie crust ready and in the refrigerator (if it’s a no bake crust). Then you’ll measure the xylitol (or other sweetener), salt, and cocoa powder into a medium sized pot. Whisk in the almond milk (or 1/2 almond milk and 1/2 heavy cream) and 5 egg yolks. At first, the cocoa powder will ‘sit’ on top of the cold liquids. But as it heats, it will incorporate into the mixture. Bring the mixture just to a simmer over medium heat, stirring often (especially into the edges of the pot). While you’re waiting for it to simmer, proof 1 tablespoon of gelatin in 1/4 cup hot water. When the chocolate filling starts to simmer, whisk it constantly for 1 minute. Remove the pot from the heat, add the gelatin along with 2 tablespoons of butter and 1 tablespoon of vanilla. Pour the mixture into a deep dish pie pan, cover with plastic, and refrigerate at least 3 hours to let it firm up. And you have a great summertime treat – Trim Healthy Mama No Bake Chocolate Cream Pie! While you're waiting for it to come to a simmer, add the gelatin to the ¼ cup hot water and stir well. Set aside.